The Temperature Humidity Index (THI) is an important measure in determining if cows are becoming heat stressed. A THI is a single value that is calculated from dry bulb temperature and relative humidity to represent the level of thermal stress relative to environmental conditions. Recently re-evaluated at the University of Arizona to incorporate modern-day, high-producing Holstein dairy cows, studies show that cows become heat stressed at an average THI of 68. This is in contrast to 1950’s data published by the University of Missouri that set the mark at a THI of 72. Keeping cows cool can be especially hard in loafing areas where cows are often quite crowded together. Even when shelter is provided, the cows will compete for the limited space in the shade, which can lead to smothering. It can also be hard to provide adequate wind flow, which is essential to keeping animals cool. Farmers often see serious health issues when cows are in the transition period of 3 weeks before and 3 weeks after calving. Cows are naturally inclined to eat less during this period from the stress of calving, which can lead to ketosis. When cows begin to metabolize fat for energy, they lose weight rapidly and health effects can snowball. Major problems include placenta retention and infection, hypocalcemia, displaced abomasum, and suppressed peak milk production. This leads to involuntary increased cull rates and suppression of profits, which can lead to serious decline for a farm. When temperatures exceed 103 degrees Fahrenheit (39 degrees Celsius), spontaneous abortion in pregnant cows can occur, along with pneumonia, salmonella, bovine viral diarrhea and many other diseases that flourish in hot weather. When cows are kept properly cooled, the potential for these problems is significantly reduced and milk production increases exponentially. However, farmers struggle with designing highly efficient and cost-effective solutions. That’s where Koolfog comes in. Our misting systems provide high ROI and are proven to work. Operating at pressures of 1000 psi+ Koolfog produces micron-sized water droplets that, while evaporating and turning to vapor, remove heat from the air, cooling the surrounding area. The dry fog produced by a Koolfog system reduces outdoor and indoor temperatures by as much as 35 degrees Fahrenheit, which makes even 100+ degree days comfortable. Systems are customizable and can be expanded to fit a huge enclosure or kept minimal for single stalls. Our systems have been proven to help keep animals safe and comfortable, even in extremely warm temperatures. 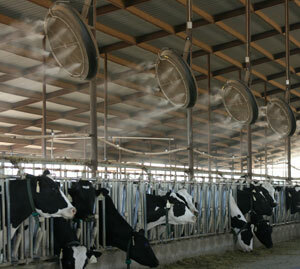 While alternative forms of cooling such as soaking are available, a Koolfog system may also provide cooling in areas that are particularly difficult to reach such as loafing areas, where cows have the freedom to move and are not held in place.